Back in September 2011 we looked at the original badge of the Middlewich Ramblers Cycling Club which was passed on to my late father by the Revd J.W. Fortnum when the club was revived sometime in the 1920s. 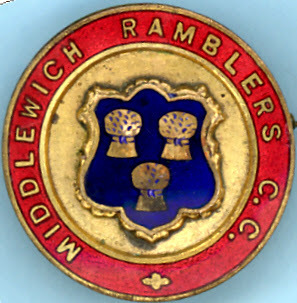 In the original diary entry I mentioned that, somewhere, I had another badge, which must have been the badge of the 'new' Middlewich Ramblers CC from the 1920s. This, as can be seen, has now come to light, and is reproduced above. The actual badge measures 1" across. It's a rather more modest and simple affair than the original badge, and its main feature is the wheatsheaf motif in the centre, proudly proclaiming the club's Cheshire origins. According to Allan Earl the Revd Fortnum came to Middlewich in 1892, so the original Middlewich Ramblers Club will have been founded some time after that, probably during the Victorian era.. 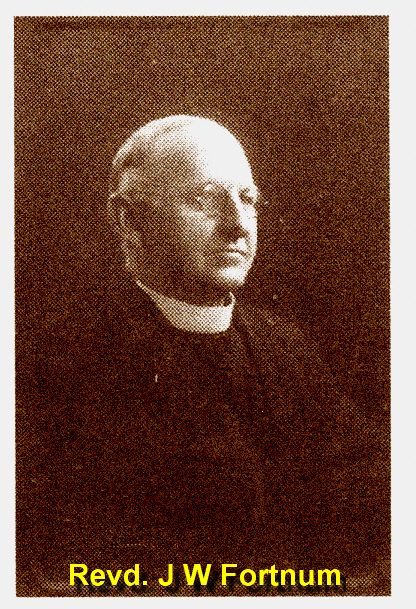 The Revd was a keen cyclist and, at the turn of the century, cycled to London in one day - a distance of 173 miles! He was also a keen golfer, footballer, angler and billiard player. So in the 1920s, when my father and his friends decided to revive The Middlewich Ramblers Cycling Club the Revd Fortnum must have approached them, or been approached by them, and given them the badge of the original club as a keepsake.